What are the four myths about the PMBOK® Guide? What is the PMBOK® Guide Current Reality? This topic is the subject of our first e-book on the Guide, part of 2-book series. The Four Myths is a chapter in this first e-book. In this chapter, the focus is on myths about the guide. There are many, but we discuss the leading four myths listed in the image. It is vital to stress that some of these myths have deep roots. Consequently, some of the content of this chapter might be a shock to the conventional wisdom of a few project management practitioners. 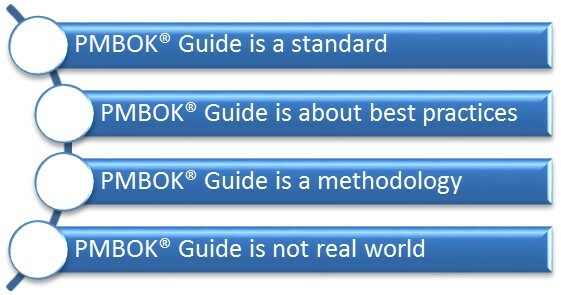 The PMBOK® Guide is a framework, as explained in the first chapter. However, most practitioners also label it as a standard, but this is not accurate. Unfortunately, the ANSI stamp and the “Global Standard” phrase on the cover of the guide, are direct contributors to this confusion. Let’s start with the ANSI stamp. What most people do not know is that the PMBOK® Guide (the whole guide) is not a standard, even though PMI put ANSI stamp on its cover. The only part of the guide, an Annex, is the ANSI standard. In other words, the ANSI approved ‘Project Management Standard for Managing a Project’ is only about 40 pages out of the guide 616 pages; that is less than 7% of the content. In short, the PMBOK® Guide includes the standard that ANSI approves, but the other sections are developed by the volunteers and not officially recognized as a standard. “Chapter 3 is the standard for project management.” (Project Management Institute, 2008). Here is another the quotation from the 5th edition: “The PMBOK® Guide contains the standard for managing most projects most of the time across many types of industries. The standard, included in Annex A1, describes the project management processes used to manage a project toward a more successful outcome.” (The Project Management Institute, 2013). Another misleading item that is contributing to this confusion is the phrase “Global Standard” that is on the top left corner of the cover below the PMI logo. Who – which authority – which global organization – has recognized this guide as a Global Standard? The answer is not readily available and will leave this point open. What is the relevance of this point? Our aim is to help minimize the myth that the guide is THE STANDARD for project management. Thinking that it is, lead un-experienced professionals to over-depend on it. Another common myth is driven by marketing of PMI and associated organizations, such as PMI chapters and training providers that have made a business from certification preparation courses, for some, the only source of income. This myth is about the PMBOK® Guide promoting the project management best practices. The PMBOK® Guide is about good practice; it does not offer project management best practices! If the guide is THE BEST PRACTICES then why look elsewhere? Can anything top the best? The first myth was primarily due to PMI and its marketing, the second one is a combination of PMI and other parties but also driven by marketing. This third myth is also driven by marketing, but its root cause is primarily due to a genuine misunderstanding of the PMBOK® Guide; including by those who deliver classes about it. It is also unfortunate that some of those who do not understand this fact are approved by PMI as Registered Education Providers. It is quite common to see advertisements for courses, or request for proposals, or online discussions referring to the PMI, PMP, or PMBOK® Guide Methodology. Well, one does not exist. The PMP is a certificate, the PMBOK® Guide is a framework, and PMI does not offer nor promote a methodology. Do not take our words for it, refer to Chapter 1 of the PMBOK® Guide. Consequently, because the guide is not a method, the recommended practice is for organizations to develop their methodologies, which can align to the guide. This is what SUKAD did in 2007, when we developed The Customizable and Adaptable Methodology for Managing Projects™ (CAM2P™). Help the project management practitioners understand that the PMBOK® Guide, on its own, is not enough to manage projects; there is a need for a method to supplement it. Without a method or a well-defined project life cycle, the management of projects is deficient. A critical point, related to this myth, the confusion between process groups and project phases. Like the previous myth, this one is also driven by a misunderstanding of the PMBOK® Guide; including by those who deliver classes about it, unfortunately. Because, some professionals expect the PMBOK® Guide to be a Manual. They expect it to be a step by step approach and include templates and flowcharts. They do not understand that the guide is not the organizational project management system. The guide assumes that an OPM system exists in the organization and refer to it via the organizational process assets (OPA) that were mentioned earlier. It is also common to hear, “Do you, really, want me to apply the 47 processes? It takes an army to do this work”. We usually smile when we hear this statement and say “Yes, you have to use them, and not only once, but repeat for each phase.” One can only imagine the reaction. In closing, the PMBOK® Guide is REAL WORLD. The author has been in project management for three decades and cannot remember working a project without these processes or variations of them. The author experience includes working on small projects, medium projects, large projects, and mega projects. Regardless of the size, the repeated project management processes and project life cycle are necessary. Yes, the guide is not a manual but it is not intended to be. It cannot be a manual since there are numerous variations of industries and project types, and one-size does not fit all. This is why it is a guide and need to align it with a method and other elements. ANSI = American National Standards Institute; it is the United States of America standards authority. The bold emphasis is by the author. This is the subject of the next section in this e-book. Refer to Section III of this e-book. This entry was posted in Applying Project Management, Project Management Methodology and tagged Best Practices, Methodology, PM Standard, PMBOK Guide, PMI on 28 October 2015 by Mounir Ajam.